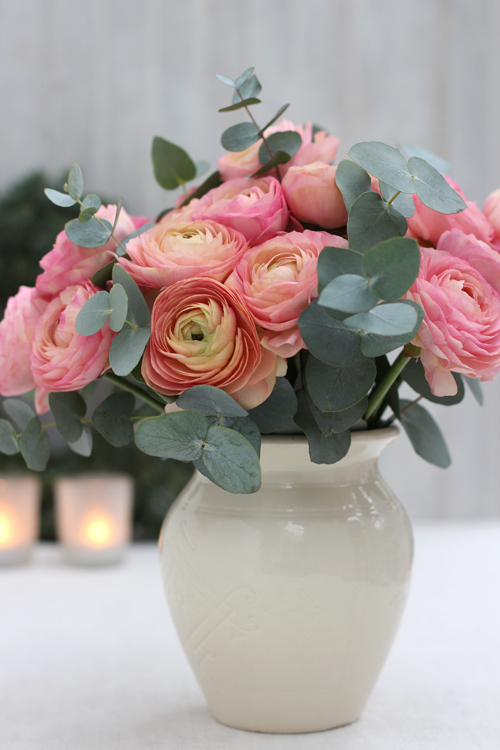 'A Bunch for the Weekend' - this week is a combination of pink Ranunculus and grey-green Eucalyptus foliage. 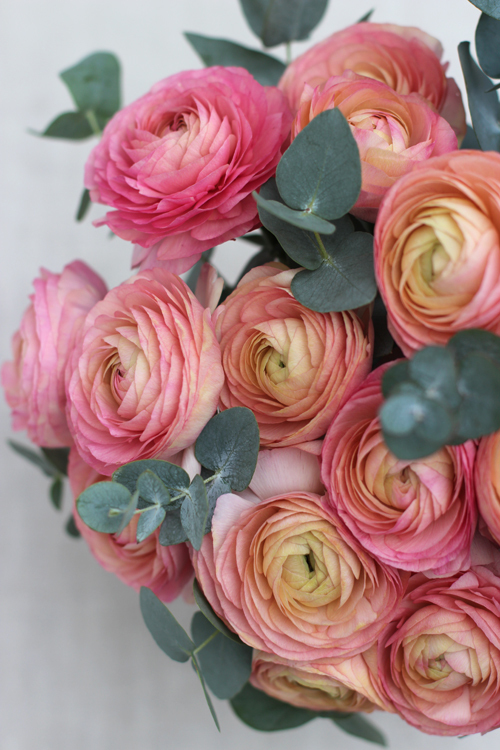 - 20 stems of Ranunculus in any colour you like - make sure the flowers have not opened up too much - you want them to last as long as possible and once you put them in a warm room they will open up quite quickly. - 10 -15 short stems of Eucalyptus foliage - if you get a few longer stems you can easily cut them into shorter lengths. - a low vase or container - in this case I have used a vintage white jar. 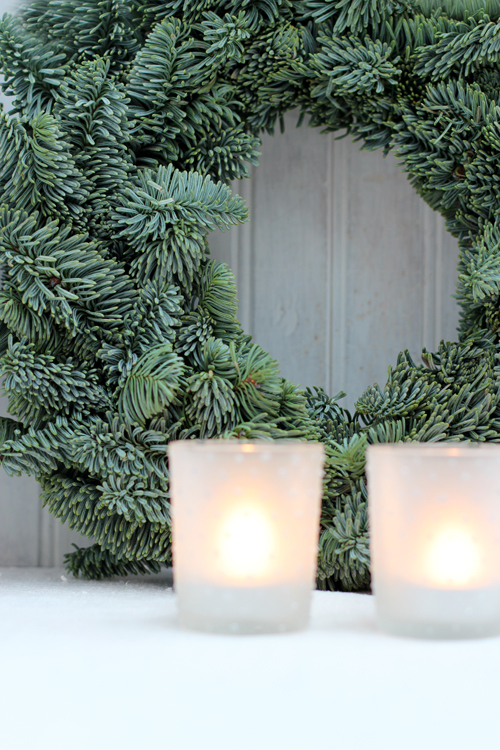 - as props I have used a small Christmas tree wreath in the background, two sparkly tealight holders and piece of fabric in colours similar to the flowers as well as a piece of lace tablecloth. - Start with the Ranunculus - remove any damaged leaves - or in this case I removed all leaves - they often look a bit sad. - Measure the stems against the side of the vase and cut the stems so that the flower heads sits a bit above the edge of the the container. -This kind of arrangement looks quite nice when you keep it fairly low and compact - cut the flower stems around the sides a bit shorter and the flowers in the middle a bit longer. - Keep the water level in the vase fairly low. Ranunculus stems has fine hairs that can encourage fungal growth. -For the same reason don't overcrowd the vase/container or the stems will rot. - Keep an eye on the water level and change water every 1-2 days. The big flower markets around the world start selling Ranunculus from end of November and the season carries on until around May. 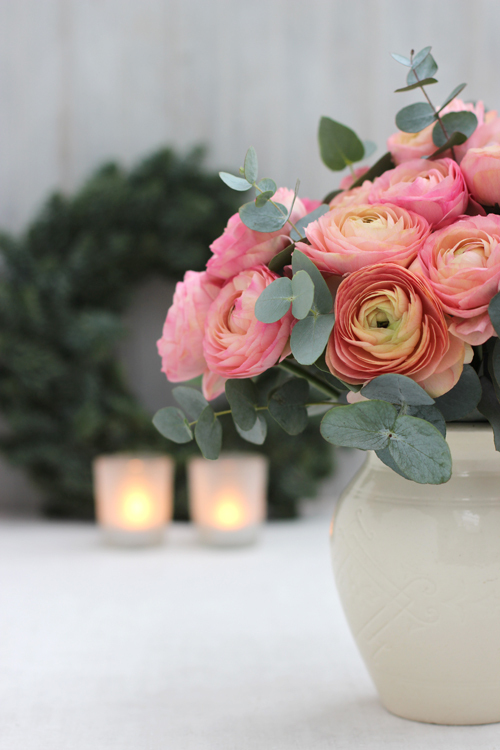 It's not unusual to be able to use Ranunculus for Christmas as well as Easter. 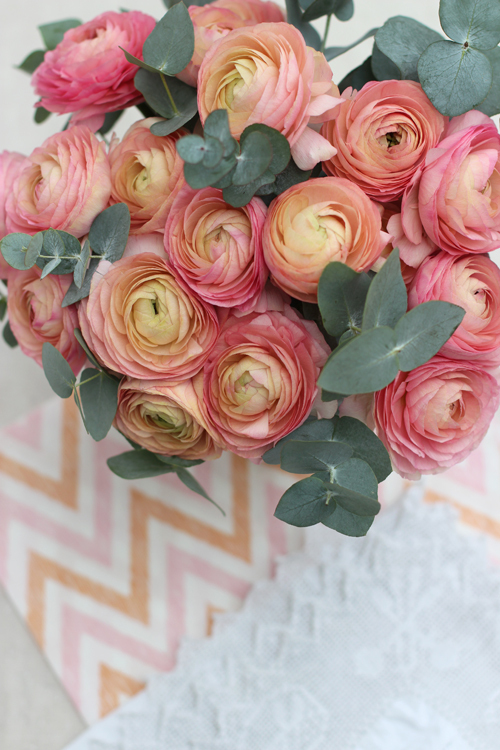 Enjoy your flower arranging and have a great floral weekend! I'll be back on Sunday with 'Florets' - more floral quotes from people passionate about flowers. They are lovely, also with the eucalyptus! WOW! Beautiful Flowers. I really like your idea to present this flowers.thanks for sharing.Have a nice weekend!